Leaders, if you are struggling to keep your team inspired, motivated, and engaged, look no further than within yourself. Yes, you! According to the 2014 Trends in Global Employee Engagement report by Aon Hewitt, leaders hold the “golden” key to engagement above all the top drivers and most specifically through their interactions with others. Additionally, Gallup’s State of the American Manager (2015) report states that “managers account for 70% of variance in employee engagement” and may be the reason why only 30% of US employees, and 13% worldwide, are engaged. The power to raise the levels of engagement is within you! Engagement happens with one person at a time. The key is in deepening your relationship with each employee. Get away from your desks and devices and let’s get REAL with people. 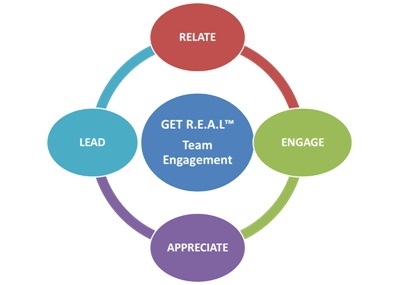 Here are four “Get R.E.A.L” practices you can implement immediately to have richer interactions and build better relationships with your employees! Relate! Somewhere along your path to success, you had a leader that inspired you, cared about you, and took the time to know you as a person; not just a worker-bee. What were the leader’s specific behaviors that moved you to give 100%? What meaningful conversations are you having with your team…beyond the smiles, morning greetings, and delegations? Employees want to know and feel that what they do for you on a daily basis really matters to you, the team, and the organization. Show and tell them. Schedule time for one-on-one meetings with your team members. Make it a priority. Engage! Now that you’ve taken the time to connect, it’s important to relate a little deeper by sharing some of your own stories. With your inspirational leader in mind, what are some lessons you learned that are relevant to your team? What did you learn from your own mistakes? Talk about values and behaviors and not just the financials. These stories send a humble message that says it’s okay to be human and no one is perfect. The results are subtle and have a positive impact in building richer relationships with employees. Learning is a lifelong journey. Appreciate! Think again about your inspirational leader. What did he/she do or say that made you feel appreciated and valued? How often did you receive feedback? Never underestimate the power of appreciation. This one incredibly simple leader behavior is often missed and can save you millions in lost productivity and turnover. While money is important, it isn’t always the number one motivator for employees. According to the US Department of Labor, 64% of Americans leave their jobs because they don’t feel appreciated.1 Just saying thank you isn’t enough sometimes. Take it up a notch. The old saying “catch them doing something right” still holds true. Focus on the job well done AND express the value he/she brings to the team as a person. Lead! What style did your inspirational leader apply with you or others on your team? What differences in style did you notice when your leader worked with a new employee versus a veteran? As you practice relating, engaging, and appreciating each employee, you will learn how to adjust your leadership style to the individual based on their needs. There is no “one-size-fits-all” leadership. It’s all about applying “different strokes for different folks.” Ken Blanchard’s Situational Leadership addresses four leadership styles used to influence employee performance based on the individual’s development level. Leaders! You’ve got the POWER to get R.E.A.L with your team to BE their inspirational leader. These simple, low-cost practices will have a direct impact on you, the team, the organization, and the 70% variance. When leaders appreciate, Together Everyone Achieves More.